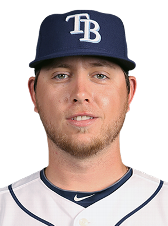 Former UB pitcher Steve Geltz earned his first major league win Tuesday for the Tampa Bay Rays. Geltz entered a 2-2 game with two outs in the bottom of the sixth before retiring Toronto’s top four hitters — Jose Reyes, Dalton Pompey, Jose Bautista and Edwin Encarnacion — over the next 1 1/3 innings. Tampa took the lead in the top of the eighth inning on Desmond Jennings’s sacrifice fly, which made Geltz the pitcher of record. Grant Balfour came in for the hold and Kevin Jepsen nailed down the save, giving Geltz his first win in 17 career games, dating back to 2012. Geltz evened his career record at 1-1 after picking up a loss last September. A graduate of Wilson High School, Geltz played three years at UB until 2008, when he signed with the Angels organization. He still holds a share of UB’s career record for saves (16). Geltz made his big league debut with the Angels in 2012, was traded to Tampa in 2013, got suspended in 2014, and made the Rays’ Opening Day roster this year. Through 5.2 innings so far, Geltz has an ERA of 1.59 and a WHIP of 0.71.